I can’t believe how much more bright my kitchen is now! It looks so fresh and clean too. Here are a few teaser shots before I get into the tutorial. Okay, here is the “before,” which is really kind of a “during” picture. I forgot to take pictures before we got new appliances. I will dig around and see if I can find any pictures of the real before. We still haven’t got our new cabinets we ordered. There will be a pull out garbage next to the dishwasher, a pantry next to the fridge, and some upper cabinets above the fridge. I was so stressed about how to approach this project. I had read a lot of posts about sanding, stripping, and de-glossing. I didn’t want to do any of those things so I put off doing anything at all. Then one day I was thinking about it and decided I didn’t HAVE to do any of that. 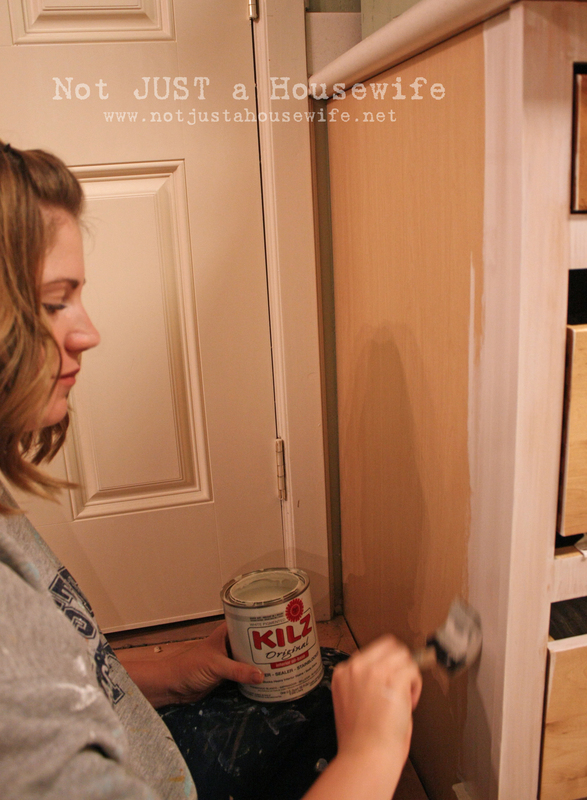 I don’t do that when I paint a piece of furniture, so why do I have to for cabinets? I have furniture in my home that I painted 9+ years ago and it is fine. I figured (and hoped) my cabinets would be okay too. Okay, the first thing I did was take off all the cabinet doors and hardware. 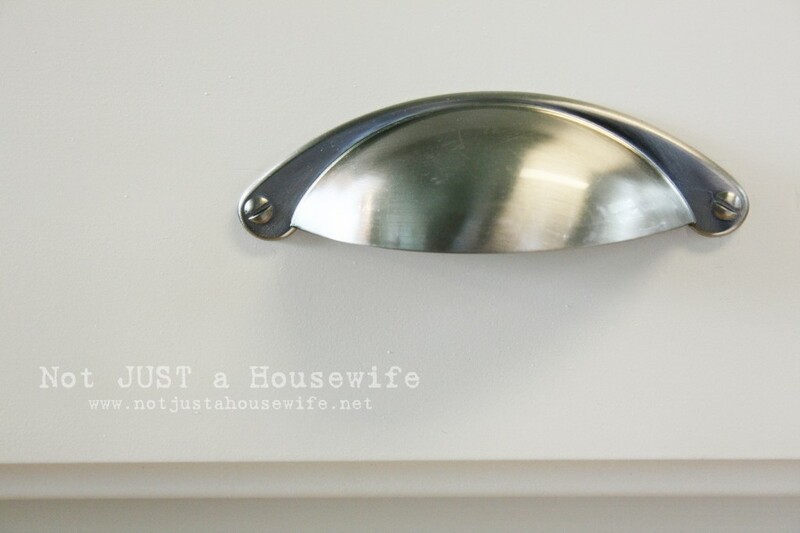 I had replaced the handles a while ago and never got around to filling in the old holes. So I finally got them filled! The MOST important step (in my opinion) is to clean them really well. 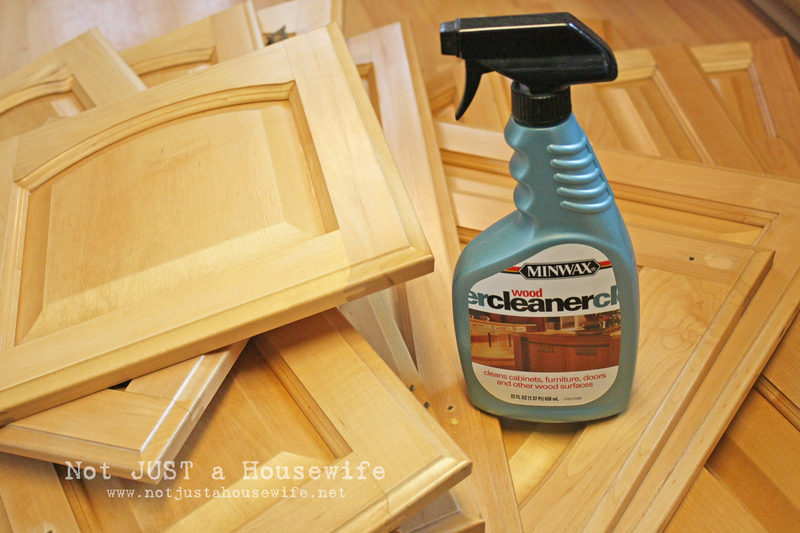 You don’t want any grease, food, or residue on them or the paint and primer won’t stick. I scrubbed mine with a soapy rag to get all the food off and them used Minwax’s wood cleaner to finish it off so there wouldn’t be any residue. What ever you choose to do, just do it well. This is not a step to skimp on. When you ask your husband to pick up a new drop cloth, put an emphasis on CLOTH. This plastic was a pain in the rear since it was windy. I had to put a ton of rocks on it. I used Kilz spray primer. I totally had a spray paint affair!!! I am usually a Krylon girl and I cheated on on them!!!! I was in Home Depot and I saw this Rust-Oleum 2x paint and I wanted to give it a try. Anything to save on $$$ right?? Plus it was an EXACT match to our dishwasher that we needed to have blend in with the cabinets. I loved it. Yep. It covered really well and the satin finish is GORGEOUS. In order to have regular paint to paint the cabinets inside so they would match the doors, I sprayed some of the spray paint on a piece of card stock and had the lovely folks at Home Depot color match it. I got one gallon. I used regular primer with a foam brush to apply a thin coat and them used another foam brush to apply the paint. It took 3 thin coats of paint with a few touch ups. I was so tempted to just put a thick coat and call it good because it was taking forever. But I knew it wouldn’t look as good and that I would regret it. Thin coats are ALWAYS better and the foam brushes minimize lines. I am only showing a few pictures of them painted because A) not all the doors are back on yet and B) I want to save the “big reveal” for when all of the kitchen is done. I am installing new floors this week, using my clearance items to decorate, and making curtains. I also have two surprise projects in the kitchen/dining room that I SUPER DUPER excited to do and reveal!!!!! Looks fantastic!! Did I get it right that you spray painted the door fronts??? HA! I think thats brilliant! WOW! I don’t know how u find time to do everything. So far it looks amazing, hopefully I can see the finished product in person soon. Ohhhhh, I looooooooove Heirloom White. It’s pretty much also what started my love affair with spray paint and blogs, since a blog got me hooked on it! They look aaaaaaaamazing!!! And yeah, they looked nice before, but wooooowzaaaa now!! Did you do anything to seal them? My cabinets are already a gorgeous white, but I’ve got an island that is cherry colored fake wood (bought to match a previous house!) that I’m considering painting but afraid it will take a million coats!! Gorgeous! Thanks for the tips, as well. And I can’t wait to see the final reveal! Btw, in case you want to continue cheating on Krylon (haha), the Rustoleum is cheapest at Home Depot! You might already know that, but I’ve found even with a coupon at other stores its still cheaper there! Thank goodness there is an HD literally almost across the street because I’m always sending the hubby mid-project to get another can of whatever color it is I’m obsessed with at the moment! Yay! It looks great so far! Can’t wait to see the big reveal! Good luck on all the rest of your kitchen projects. It’s a love hate realtionship when redoing kitchens. Love it when it’s done and hate not having a functioning kitchen in the process. You can switch out the nozzles between the spray cans & get the best of both worlds. I think I will be following in your footsteps soon–hopefully. The whole process just scares me. The cabinets aren’t ‘old’–they’ve been here for 6 years. But I am DONE with the closed-in-dark look of my kitchen. 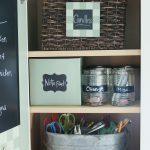 I love how your cabinets are turning out–thanks for the tutorials!! 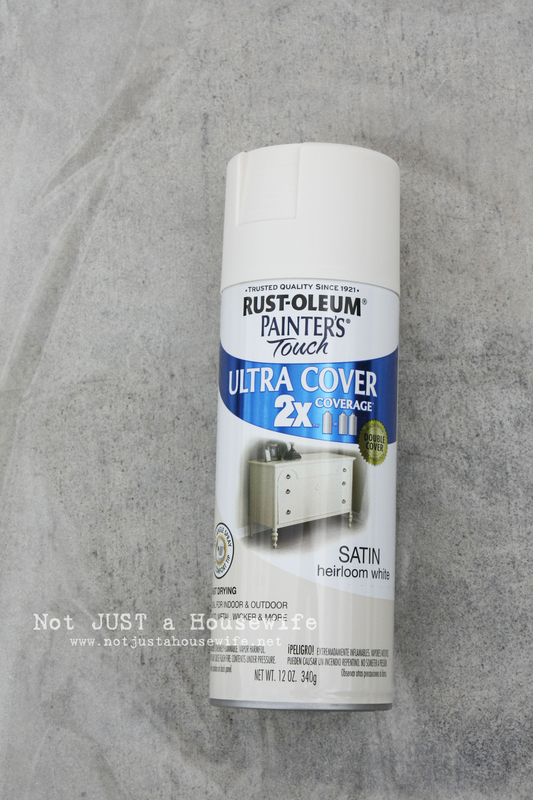 I too am enjoying the Rustoleum 2x cans–they cover really well! I love how it is looking…I agree about that spray paint. 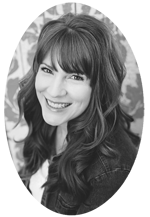 I have used it and it worth the extra money because it covers really nicely – I was skeptical but it worked great!! Great job, they look wonderful and brand new! These turned out beautiful! Spray paint amazes me:)!!! Your kitchen looks bright and lovely! That is awesome. I am now seriously thinking about doing that in my kitchen. My cabinets are yellow and black. No lie. Not a cool yellow and black either. It’s disgusting. Great job on yours! Can’t wait to see the full reveal! 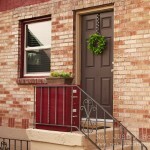 You used spray paint to do the doors!? I’ve never heard of anyone doing that! I am just about to start my kitchen project next week. I think I’ll try it – it’ll probably save me a ton of time! Looks fantastic. Your wall color looks the exact same as our kitchen’s! 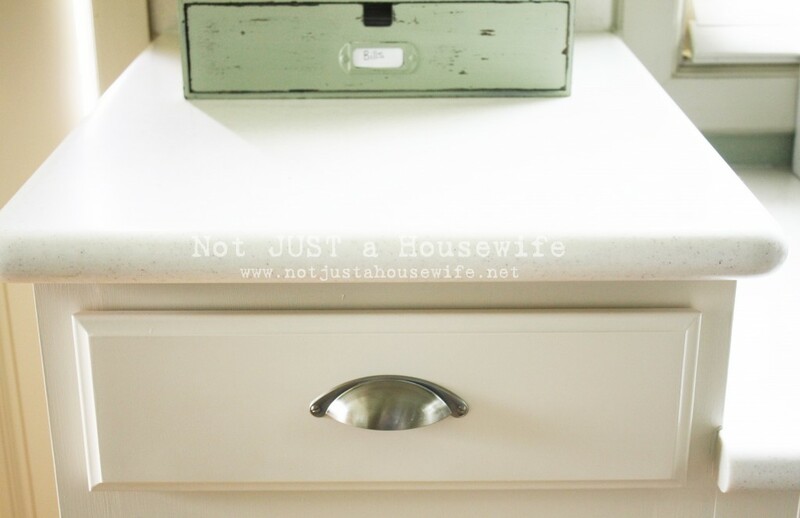 We painted our cabinets a chocolate brown last summer, but I love the white too. Nice job. Holla! 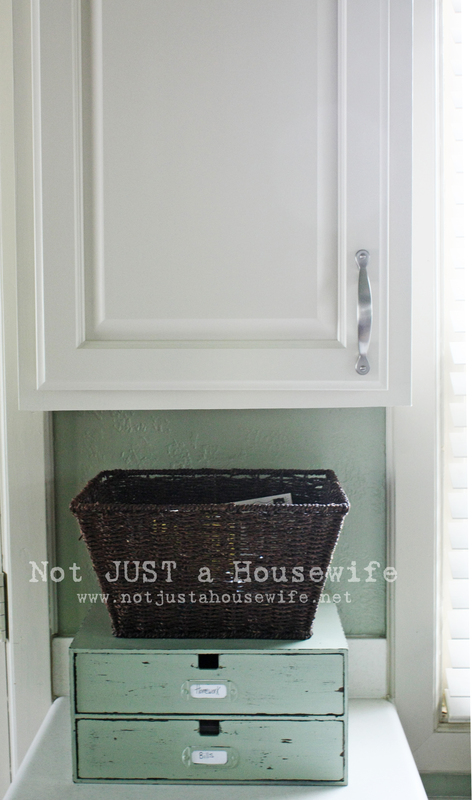 You painted your kitchen cabinets with Heirloom White? It’s only, like, my favorite! Awesome job girl! Love the result, bravo! How are your painted cement steps/walkway holding up? Dying to know, considering painting my cement patio. SO glad I read your post! I have been wanting to paint my cabinets to but don’t want to sand. Primer sounds perfect so I guess it is time to get the project started finally! Wow they look awesome! I would never have considered using spray paint, but it looks great! Makes me regret going the traditional route LOL! They look amazing! So fresh! Now I just need to convince Jared that we need to paint ours! It looks great so far!! I am so excited to do mine. Yay! wow… that was a big spraying affair indeed! i spray painted a small cabinet once, and felt like my finger was falling off!!! 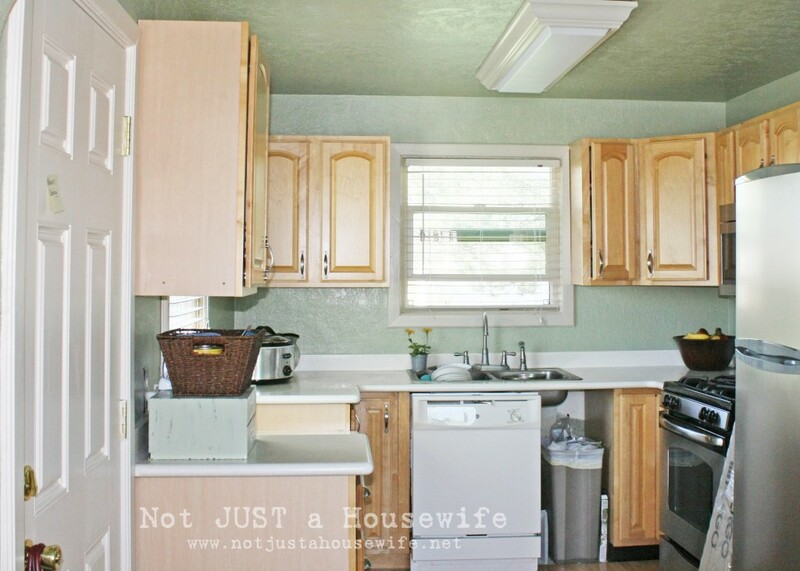 I soooo want to paint my cabinets! I have the same ones you do (did) and yours look sooo great! Your kitchen is going to look fantastic I can tell already! I have considered using the spray paint but never saw it done and didn’t know if it would hold up or not. Do you think TSP would do the same thing as your cleaner did? I have never seen that cleaner in the stores. For all of those who want to try this, did you know there is a contraption that you can buy that fits on the top of your spray can to save your fingers. It has a lever that uses the whole hand so is much easier to operate than pushing that little button on the sprayer and it is only about $3. Thanks for the tip about the Rustoleum 11. My husband said the contraption for the top of spray can does NOT work – he says to do some finger exercises to help get ready for the can. It most deff works and is my FAVORITE item to use while painting. Think I can do this on old Melamine Cabinets too??? oooh I can’t wait to see the whole shebang! SO EXCITING! So far, looking fab! Thanks! I had learned of that product at the beginning of the year but truthfully I had completely forgotten about it. If I had it to do again I probably would have done the spray paint again because of the cost. It only took 2 and a half cans to do all my cabinets plus a few cans of primer. Found you over at taterots & jello! Your kitchen redo is amazing! At least what is done I guess. All you ladies are getting me inspired to get painting! BTW, I’m your newest GFC Follower! Thanks for the inspiration! Yay! 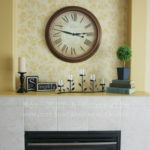 You have an answer to my BIG question: What is the color match to Rustoleum 2x Heirloom White? I want to paint two bookshelves the same color. 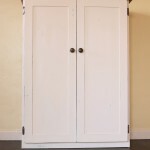 I recently spray painted a giant armoire with Heirloom White and I found it took waaay too many bottles of it! I figure paint in a can will be less expensive. I’m from Canada, and here the spray costs 6.99 at Home Depot. If you have not discovered Sherwin William Chip it, it is amazing. You can download and match any color, from any picture, etc. I get the sample from S W and have it mixed in the paint of my choice. or take a sample board to Home Depot and have them exact match the paint. Get a sample and try it, then buy as much as you need. Oooh don’t tempt me! I’ve been debating on painting my old outdated cabinets for what seems like forever but don’t know if I can handle all the prep work plus the painting. This may be the way though! Can’t wait to see the big reveal!!! Looks great! What type of wood are your cabinets? The finished product is awesome! thumbs up my dear! You may have just inspired me to do the same thing!! A few months back I wrote a post asking my readers if they had painted their cabinets white and if they had held up well. I was nervous to paint them white but I got and overwhelmingly positive response. So I am hoping that my readers were right!!! Hi. Nice job. I’ve done my cabinets twice before but, it’s time for an update. It’s a big job, I have 34 cabinets and 12 drawers and I’m always ready for any idea to make the job easier. I have one question, between the picture of the cleaner and the rustoleum, you said you used Kilz spray primer. But, in the pic with the primer, it’s not a spray. Did you mean spray ‘paint’? or did you in fact find Kilz in a spray? So.. I’ve been waiting 6 yrs for a reply… .. Your cabinets look amazing! I want to do it too! Did you pain the inside of them as well? And were both side of the doors sprayed? Thanks! Wow! this is awesome! Thanks so much for the encouragement! I am doing the same by just avoiding, because I thought it would be super difficult! I LOVE, LOVE, LOVE the transformation. 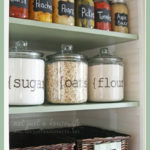 This is exactly what I’m going to do on my cabinets. I can’t wait to do this!! Inwas wondering if you’d share the wall colour *pretty please? Did you use anything to seal the paint? If not is it easy to wipe spills off? i was just wondering what did you use to seal them? and did you put primer on everything? please respond. thanks i have so many of your ideas in my home. CRAZY! I JUST spray painted my kitchen cabinets with the EXACT same spray paint. My only problem is I seem to see the spray “blotches” when a curtain light hits the doors. It is completely painted AND I primed it before. Does your do that?? If not, how did you make it so even? Keep the can moving constantly from left to right, right to left about 10-12 inches from cabinet, even if it does not cover the entire thing the first time, let dry and come back to it. It will provide a more even distribution. @ Not Just A House Wife – I’ve been looking at this site off and on for six months trying to decide whether or not to take the leap and redo the cabinetry in my condo. I finally started it yesterday morning and I could not be more happy with the outcome. With the weather at a more frigid temperature, I’m stuck doing these in my garage with cardboard, therefore I can only do 3-4 pieces at a time, regardless, THE PIECES ARE AMAZING! I’ve followed these steps as you’ve laid them out, I did contemplate skipping the primer, but I could not be happier with the results. I’m so thankful that you posted this cheap, yet efficient solution! So you used cans of spray paint????? So now being about 10 months later are they holding up well? Hi everyone! Came across your kitchen cabinet project today. I ALWAYS will opt for spray paint. The Rustoleaum X is what I use unless I am doing something in a “textured” finish. 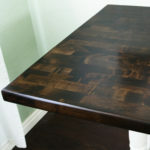 I have used Desert bisque (probably Krylon – don’t remember) to spray a set of 3 glass top tables that have. the old gold legs and trim. They are now 7 years old – very nice and when a nick happens (usually from my vaccum cleaner) I just take off the glass – take them out to the garage and sparay a few new coats on. Also used on round table and chair set for my deck. Have used 2X on wicker chairs to garden pots. Did my kitchen cabinets recently cause a new kitchen isn’t affordable right now and the cabinets are dark 70’s wood. First a few coats of Kilz SPRAY primer then the 2X in whatever color. Be careful about working in a garage that is under 60 degrees – you will get “crackle” in you. They are now a beautiful fossil light sage green ). Taped off with lots of plastic – took alot of time but well worth it – and also sprayed the cabinet bodies. New kitchen for under 5$60.00. Spray paint is the best!! Just spray prime with kilz . I have found the Menards has the best price on spray paint (it’s only in the wisconsin illinois indiana area though – I even got an instore rebate of $1.00 a can!!. I’m not very computer literate but will have my son put up my kitchen in the future! Spray on!! 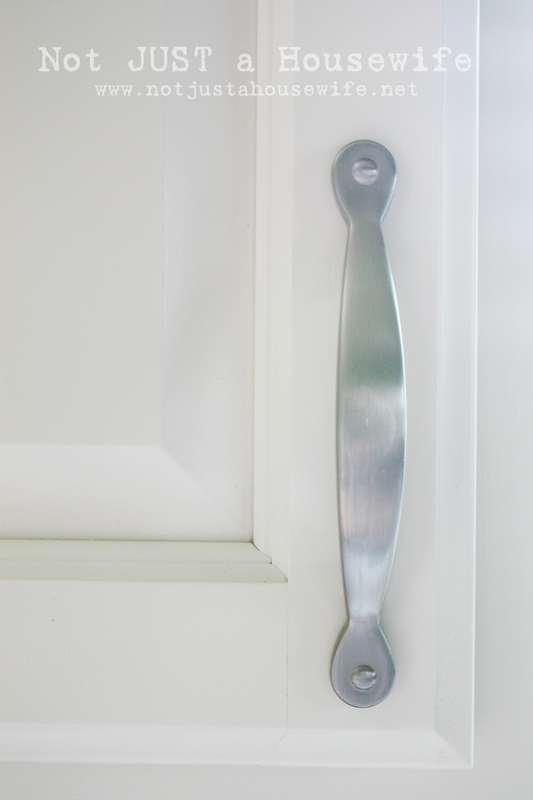 I used the Rust-Oleum white gloss and made a test on a small door first, prior to it used Klean-Strip deglosser. I removed the doors and hardware and laid it flat in a room with the narrow side facing the window, looking at door in a 30 degree (almost 3 o’clock) angle while spraying, will allow you to see the reflexion of the light on the paint showing any spots that are not properly covered. (then just go back and spray some more until you have a nice even shine all across the surface) be careful not to overspray. First I did all the edges and trim and the surface at the end. I kept the can about 8 to 10 inches away and in a 50 degree angle (1 o’clock) spraying at a uniform speed from side to side while I was moving backwards (away from the window) I hope my explanation is good enough, once you start you will see what I’m talking about. After my test (5 months ago, painting white over white no color diference) it worked so great that did two more doors last week and will finish the whole kitchen this weekend, removing the wallpaper and painting, installing tile floor and an island too. Our kitchen is 7 years old in very good shape just wear marks on the finishing, this will add another 7 while I save to do the whole cabinets, granite countertops and backsplash. Rust-oleum works!!! OK, it’s been awhile now; how are they holding up? I’m getting ready to do mine in a couple weeks and am still searching for the best method for both the ease of completing and for the long run. Since it has been a while since this was posted I may have missed this question and answer. If you are reaplacing your floors anyway, is thre a reason you didn’t just paper and mask the area and spray your cabinets? Just curious. Have a kitchen redo coming. Looks amazing!! We are buying our first home and I cannot wait to tackle this project myself! What did you use to give them a protective coat? I was soooo excited to see your pictures of your kitchen cabinets repaint project and so surprised to see that you used the same brand and same color, Heirloom White, that are are using! Our cabinet doors and drawers are NOT real wood, but MDF fiber board so they do have to be sanded ever so slightly and I’m sanding them in between coats too. I also sanded them after I put the 2X primer on. I am hesitant to spray paint inside. How did you keep the spray paint from getting on everything, including yourself, lol? 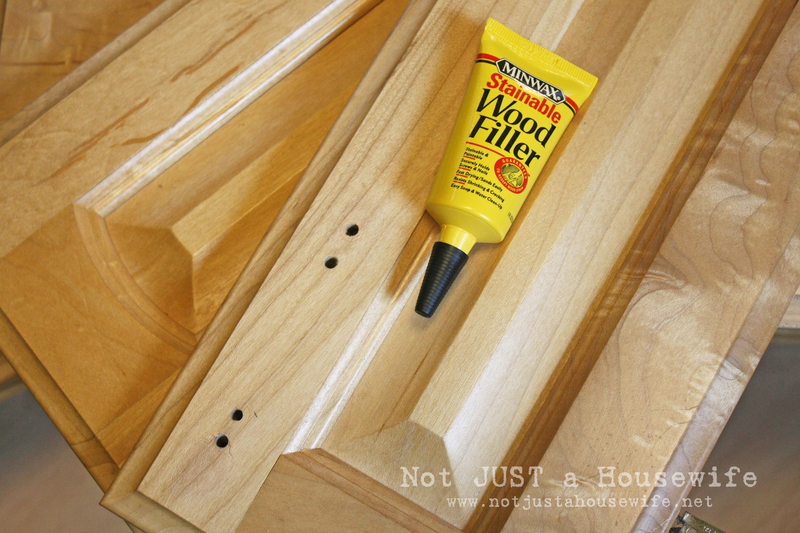 I’m spray painting the doors and drawers, but there is a Heirloom White by Rustoleum that comes in a can (a quart). I’m thinking of using that on the base cabinets. I’m taking the cabinet doors/drawers on the back porch to spray paint them. I have the plastic “cloth” draped over my windows and the table. 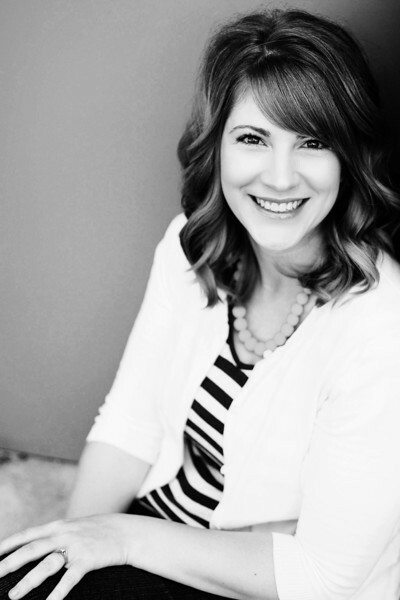 Thanks for sharing….so excited to get my project done. We’re having tile installed next week, so I have to put the base cabinets on hold. I found some real Rust-Oleum Heirloom White in a can. It comes in a quart and I ordered it from Amazon. Home Depot and Lowes must not carry it anymore. 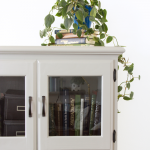 It’s called Rust-Oleum American Accents Heirloom White, Satin finish. I will be buying foam brushes and doing as you said, Stacy….a thin coat and applying one or two coats. Since my original cabinets are white, it shouldn’t take but two coats. Still will be spray painting the doors and drawers outside. I have satin nickel knobs, but am thinking I might switch them to oil rubbed bronze knobs. Having my kitchen tiled this coming week, so the kitchen project will have to be put on hold. I am spray painting my white kitchen cupboards. The floor tiles are white. What color you suggest I use to spray paint? 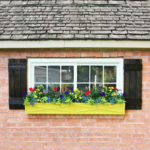 What did you paint with the Rustoleum 2X spray paint.